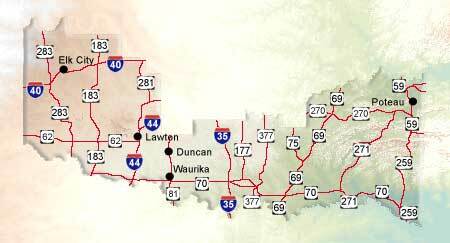 The Southern Region comprises the Great Plains, Lake & Trail, and Kiamichi areas. The first is a land of grass and sky whose horizon is defined by stark mountains. It was once home for millions of buffalo and the Plains nations who hunted them. Today, the comeback buffalo again grazes here; nearby is the early 1900s resort town of Medicine Park. Man-made lakes and reservoirs dot the Great Plains Country, while bicycle and nature tours, hiking, hunting, fishing and camping offer vacation variety. Lake & Trail country boasts four major lakes, creeks, rivers and the state's loftiest waterfall. All forms of outdoor recreation can be found here. The 100-year-old tribal headquarters of the Chickasaw Nation can be visited at Tishomingo. In Durant, the 1800s U.S. Fort Washita presents activities today. The drive-through Arbuckle Wilderness animal park offers views of unusual wildlife. In addition, old mineral baths near Sulphur are a visitor attraction. The Kiamichi area is a beautiful, mountainous corner of the state. Here is Robbers Cave, where Belle Starr and other outlaws once lived. Fly-fishing on the Mountain Fork River attracts visitors, as does the imposing Ouachita National Forest.